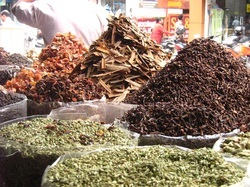 Though Jew Town has lost much of its earlier glory, it has retained its status as an important centre of spice trade. The exotic odour of the finest ginger, cloves, cardamom, turmeric and pepper, also known as black gold, emanate from the spice warehouses lining the street and fills it. The bustling trade of spices is evidenced in the trucks going to and away from the warehouses, loads being taken in and out using pushcarts, and the sight of workers drying, sorting and packing spices. And as in the olden days, both Europeans and Arabs still come to Kochi and leave her shores with precious cargo.